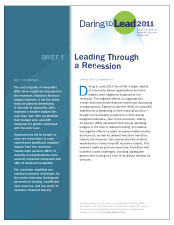 Leading through a Recession, the first Daring to Lead brief, explores the main report’s recession impact findings in greater depth. Get a downloadable PDF of Brief 1 either by clicking the button below or using the free alternate download via MediaFire.com. What is Daring to Lead? More than 3,000 executive directors participated in Daring to Lead 2011, the third Daring to Lead national study produced in partnership by CompassPoint and the Meyer Foundation, with previous studies published in 2001 and 2006. Explore this website for reports, current findings, and to learn about the implications for nonprofit executives and boards, philanthropy, and capacity builders. Visit frequently for updated content and to join the ongoing conversation about the findings and what they mean for our sector. We want to hear from you! For reference purposes, please use the following citation: Cornelius, Marla, Rick Moyers, and Jeanne Bell, Daring to Lead 2011: A National Study of Nonprofit Executive Leadership (San Francisco, CA: CompassPoint Nonprofit Services and the Meyer Foundation, 2011). © 2014 Daring to Lead. All Rights Reserved.